(basic) accomodation and food are included in all practical Trainings, in Theory-Units we prepare food and share the costs. 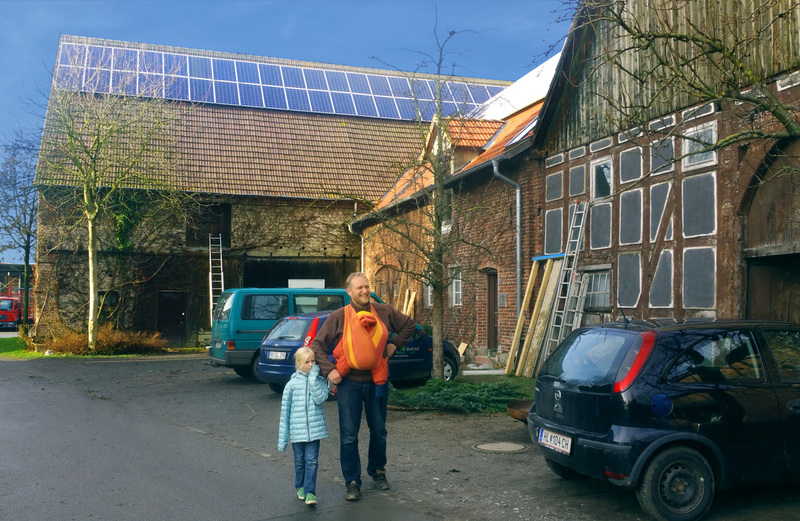 Complete training (400 h): If you’re booking the complete training before February 15th 2019, we offer you an early bird discount of no less than € 400,– AND add the extra module 1 about energy self-sufficiency as a free bonus (value € 280,–). Instead of € 4.200,–, the training would cost you only € 3.800,–. Payable in advance or by permanent order in 10 monthly rates of € 390,–. € 2.990,–, payable in advance or by permanent order in 10 monthly rates of € 300,–. 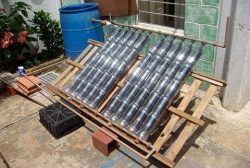 If you’re booking the complete training and pay in advance, we sweeten the deal by adding the extra module 1 about energy self-sufficiency as a free bonus (value € 280,–). Booking individual/single modules: The eight modules can also be booked individually and independently of the certificate and the final examination. In order to participate in modules of your choice, the additional visit of Module 1 is highly recommended (introduction): You will receive a European pass (Europass) of courses, in which all completed modules including assessment by the trainer are registered. 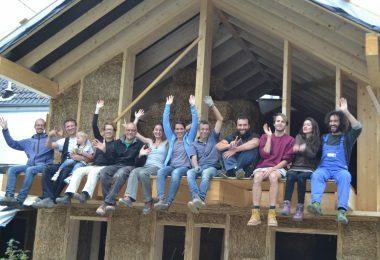 In any case, once you have completed all eight modules, you will be able to take the final exam and you will be awarded as ECVET Certified Straw Bale Builder (recognized in the European Union). 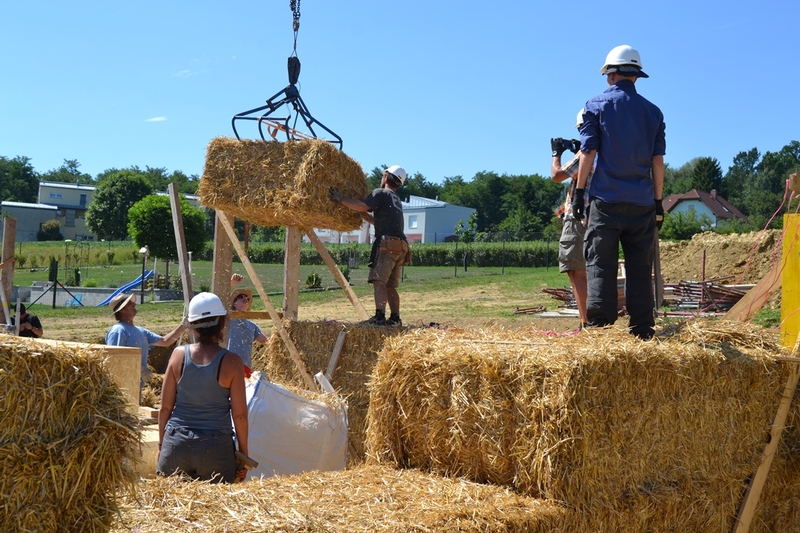 We start with a general introduction into history and status-quo of Straw Bale Building. 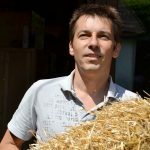 there is a lot to learn about the building material (straw bales) itself: Procurement, production, quality assessment, testing, handling, storage … The tools are presented and partly self-made (stuffers). Partner-price: Your partner just pays the reduced students-price! 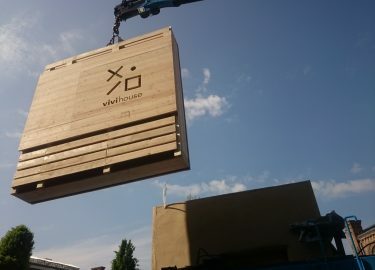 We get to know the different wood frame construction methods: Wooden constructions (CUT in the middle, CUT supporting planking, double post) are infilled with straw bales without gaps (infill = filling in), prefabricated wooden straw components (modules) assembled professionally. Bales are cut, tied and / or efficiently compressed in the walls. 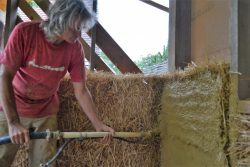 In the practical workshop, a detached house in timber frame construction is filled with straw bales and then (in the second half) plastered with clay (and lime). 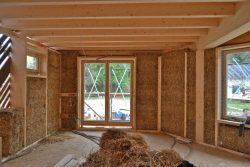 We show how windows are sealed with flax and sealing tapes, how electrical cables are laid in straw bale walls and how details are executed correctly. 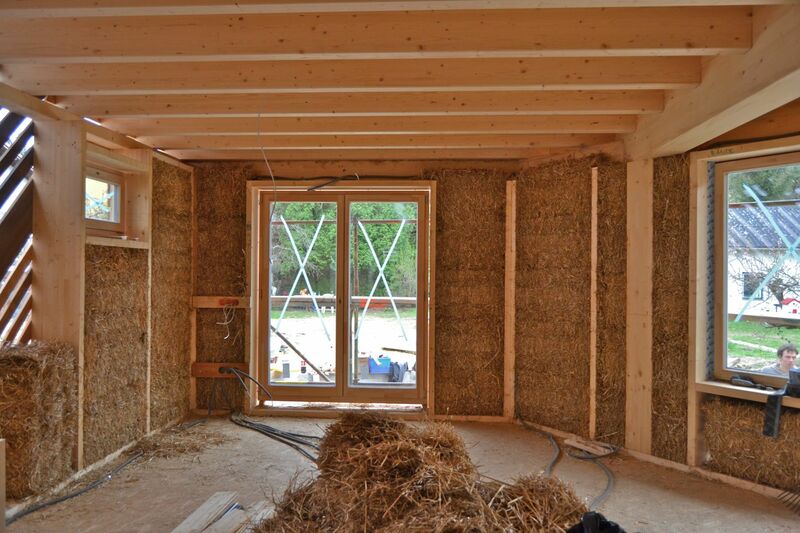 The initial straw building does not need any supporting construction for walls, the straw bales alone are „load bearing“. 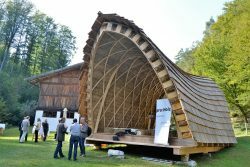 Wood is used for protection and support (base plaste, roof assembly, window frames), structural integrity (ring beam) as well as for additional construction. In theory, we handle the preparation and selection of the right bales, statics, the construction schedule and construction of load-bearing straw bale houses. In the practical workshop a building with small bales is built load bearing and plastered. In „wrapping“ buildings are all around covered with straw bales. 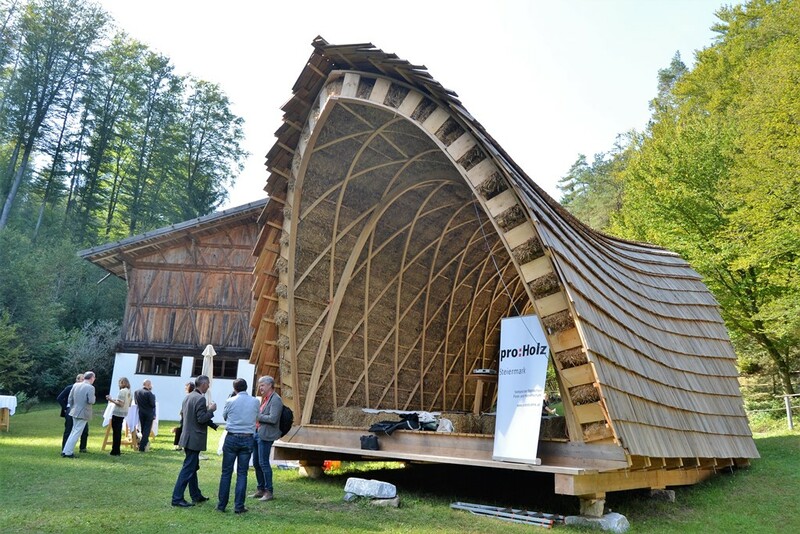 We show wrapping possibilities for insulation thicknesses from 15 cm with diagonal bracing, pallets, slats and facade panels. We learn how to make an additional foundation and set up an auxiliary construction, as well as the professional attachment and the complete, windproof design. In the practical workshops, a barn and „Fachwerkhaus“ is restored and wrapped (inside) with straw bales and plastered with clay, for fixation we assemble a CUT hybrid construction. Only the most meticulously designed surfaces prevent structural damage in the long term, especially in diffusion open building construction. Material knowledge (clay, lime plaster) as well as a lot of practice from tbase plaster to fine plaster characterize this unit. In the practical workshop, we plaster with clay (earth) and lime, manual plastering is shown as well as spray plaster. The knowledge of the building physical properties of building materials is an indispensable basis for their optimal use. It is thermal bridges, mold, moisture (condensation) … to recognize and avoid. We treat the subjects of thermal insulation, fire protection, sound insulation, moisture protection and heating and calculate and optimize straw construction according to their required properties. 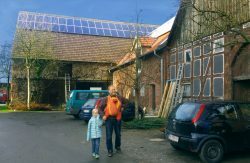 We show how sustainability, wellbeing and a healthy indoor climate can be implemented in a straw bale house. The principle of „straw construction“: You learn to read plans and to implement construction plans and know how construction, insulation, electrics, water, building services and heating … interact. With a straw construction overview, you prevent building defects and repair building damage and keep the budget within limits. 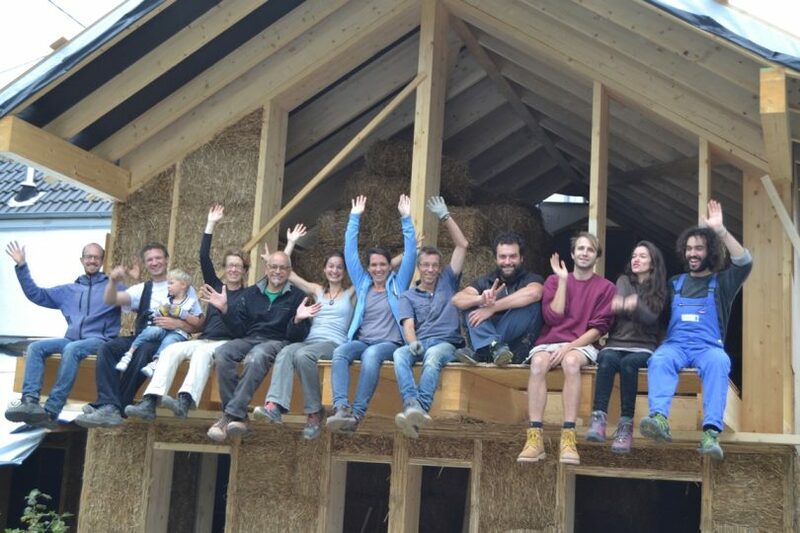 We also show how organic straw bale building is possible and how to save on building costs. 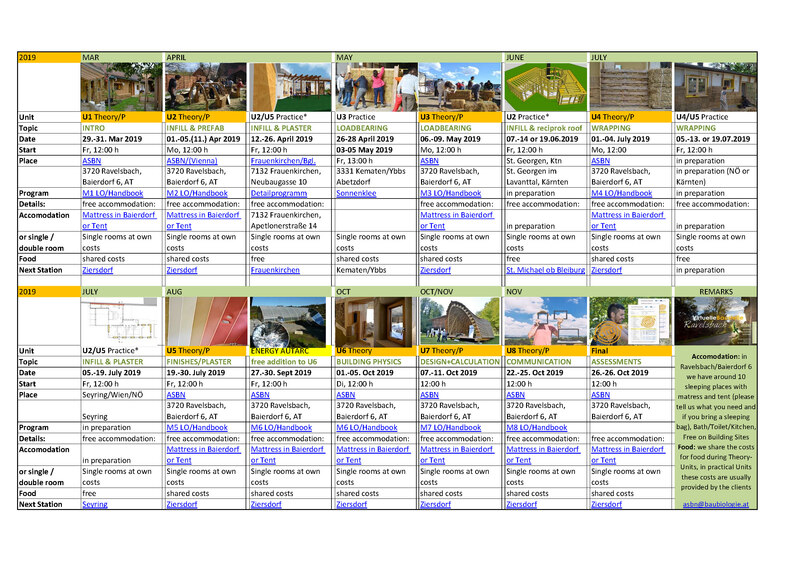 With practical workshop planning of a straw bale house, videos and discussions. Market knowledge improves your bargaining position, knowledge of suppliers and prices enables costing. We show (open-source) tools and software for self-presentation (CI), administration and successful (social media) appearance. The basis of everything is communication and knowledge about target groups, other craftsmen (networking) and suppliers (where can I get what?). 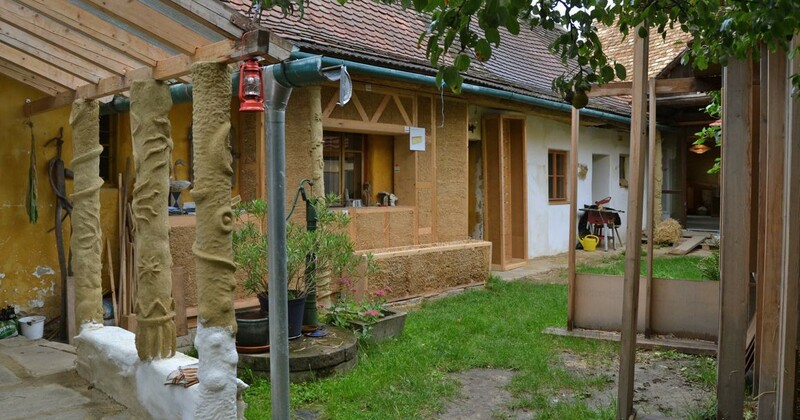 We show how the price of a straw bale house can be estimated, calculated and communicated. And explain the differences between soft and hard costs and show savings. Written & Oral Tests (also on agreement). 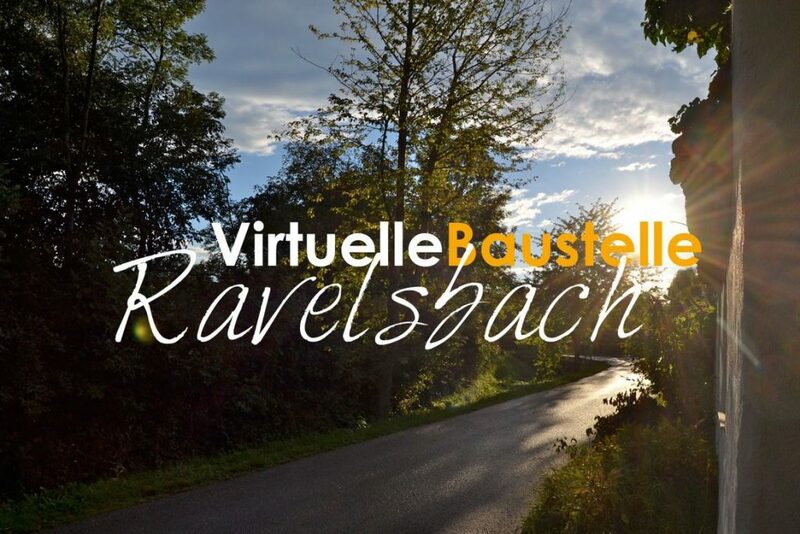 Netzwerker seit der Gründung des ASBN 1999, Obmann des ASBN seit 2006, Buchautor (Bauen mit Stroh, Neues Bauen mit Stroh), Gesellschafter von StrohTec (Österreichs erster Strohbaufirma), hat in Ravelsbach im Zuge eines Haus der Zukunft plus-Projektes die Virtuelle Stroh-Baustelle ins Leben gerufen, wo seit 2010 regelmäßig Workshops stattfinden. 2015 gründete er die Kooperation StrohNatur, die nun auch Strohballenhäuser (mit und ohne Workshops) errichtet. Copyright © 2016. Created by d.sign Gruber & Partner KG. Powered by WordPress.